I was researching my grand uncle, Ralph Swarthout, today. He was married to Hilda Baker. 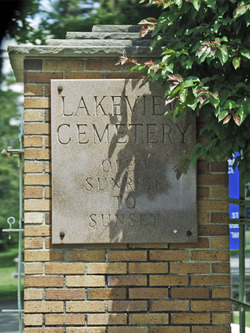 Both are buried at Lakeview Cemetery in Penn Yan, NY in a plot that was originally purchased by my great grandmother, Annie Baker. My father mentioned to me several times that Ralph had always been his favorite uncle. While looking through the cemetery records at the Yates County Cemetery Project, I noticed that Paul Baker, who was born and died in 1936, is also buried in that plot. However, nobody in the family has ever mentioned him! So who the heck is he? It’s reasonable to assume he is a member of the family, since he is buried in the family plot. He can’t be Annie’s son; she died in 1933. Given the date and that there were no other close branches of the Baker family in the area, he must be the son of either Idris and Alyce Baker, or of Stanley and Rebecca Baker. Paul could have been an illegitimate son of either Idris or Stanley. It’s also possible that he is the son of Hilda or Mabel Baker, but that seems unlikely since both of them were married at the time, so Paul probably wouldn’t have had the last name of Baker. Of course, it’s also possible that the records are wrong. But while misspelled names are common in these records, this seems to be a person that the cemetery has a record of, but that the family does not. Even if the entry is wrong, and his name isn’t Paul at all, he’s still a mystery! A search of online databases did not shed much light on Paul. There is a Paul Baker who was born and died in 1936 in Bridgend, Glamorganshire, Wales. That is interesting because the Baker family had moved to New York from Glamorganshire, Wales. However, I don’t know of any Baker relatives remaining in Wales. The Baker family isn’t actually from Wales; they were apparently just living there because that’s where work was to be found (coal mining, in this case.) My great grandparents William and Annie were both born in England. Since I know nothing about William’s family, anything is possible, but it wouldn’t explain how Paul came to be buried in New York. There is also a Paul Baker who was born and died in 1936 in Butterfly, Kentucky. I have no record of any of my family in that area, and I don’t recognize the names of his parents, so I think that is a dead end. So my assumption is that Paul was the son of either Idris or Stanley Baker, and that the family never talked about him because he never lived long enough to be considered part of the family (perhaps he was stillborn), or because he was illegitimate. He is in my database, but not attached to any family until I figure out more about him. If anyone has any information about him, please contact me! UPDATE: My brother remembers hearing when he was a child that Idris and Alyce had a stillborn child. Pending further research, I’ve moved Paul to that family.